FAA has published a major update to Aviation Weather Services (Advisory Circular 00-45H). In the past decade, access to aviation weather products has greatly improved with the increase of flight planning services and weather Web sites. The experience of listening to a weather briefing over a phone while trying to write down pertinent weather information becomes less tolerable when the reports are easily obtainable on a home computer, tablet computer, or even a smart phone. To see weather along your route using a graphic of plotted weather reports combined with radar and satellite is preferable to trying to mentally visualize a picture from verbalized reports. You can buy a bound copy of the book from such publishers as ASA, and paper is more convenient for detailed study. But the PDF version, available for free download, is handy to keep on a tablet or other device, and it’s easy to search for specific terms and phrases. If you want background on weather theory, see AC 00-6, Aviation Weather. I’ve collected links to many weather-related resources on the Aviation Resources page at my Web site. For example, A Pilot’s Guide to Aviation Weather Services, from the National Weather Service, is a quick introduction to weather services for pilots. The Bush Administration has just announced several measures to make air travel more reliable this holiday season. Whether opening some en route airspace reserved for military operations will actually reduce delays, especially in the gridlocked New York area, is an open question. As I argued in an earlier post, the knot tying up airline travel isn’t bad weather, non-airline flights, or the limitations of the ATC system (although all of these matters contribute to the problem). The core issues are runways and airline scheduling (especially the increased use of small regional jets), which have over-subscribed the available concrete. It’s as if there now are two different aviation systems in the USA: In New York, there are too many scheduled flights and hemmed-in airports that can’t expand. But at other major airports, new runways, incremental improvements in air-traffic procedures and airlines’ moves to improve efficiency have begun to make a measurable difference for travelers. Note the mentions of "room to expand" and "new runways." The airports with improved on-time records cited in the USA Today story (viz., Atlanta and Boston) have recently opened new runways. Chicago O’Hare has reduced the number of available slots and will open a new runway next year. The USA Today story also takes time to explore other issues that contribute to delays, among them cumbersome arrangement of airspace and ATC procedures. Kudos to USA Today for not just echoing the complaints endlessly repeated by the Air Transport Association, which places much blame on general aviation (i.e., all flying except that conducted by the airlines and the military). The AOPA Air Safety Foundation has started offering on-demand (free) webinars. These programs are video streams of popular safety programs that AOPA ASF has presented at aviation gatherings. You don’t have to be an AOPA member to watch these programs. The webinars feature such luminaries as Rod Machado, who has just released his Instrument Pilot’s Handbook, mentioned earlier here. The online courses and other resources available from the AOPA Air Safety Foundation are under-utilized references and learning tools, and that’s a shame. They’re terrific training aids for pilots and flight instructors. Bruce Landsberg, executive director of the AOPA ASF, notes that pilots can keep a transcript of ASF courses that they complete and can return to finish courses they started but didn’t have time to finish. Three insurance underwriters now grant accident forgiveness if pilots attend a live ASF seminar or complete an approved online course every 6 months. By then end of the year AOPA ASF should have 21 interactive programs available on its Web site. It’s a commonplace that today’s cell phones pack more computing power into their ingestible form factors than, say, the clunky boxes stuffed into the Apollo Command and Lunar Modules (v. the interminable re-runs of Apollo 13). Today’s news, however, puts Moore’s Law into an interesting new perspective. 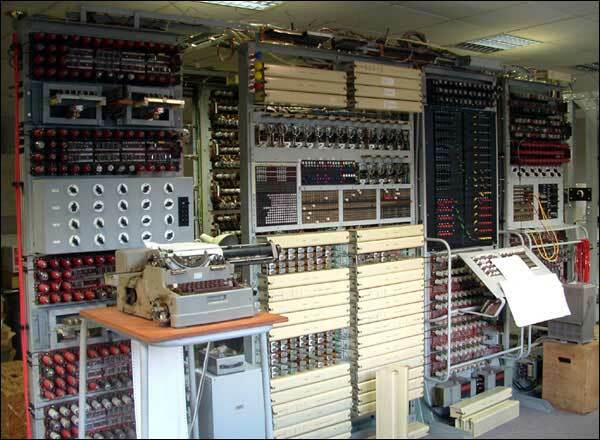 "Colossus cracks codes once more," from the BBC, reports on efforts by computer enthusiasts to test a rebuilt Colossus (image above), a computing machine used to crack German codes at Bletchley Park during World War II, against modern PCs. As the BBC story notes, Colossus "was one of the first ever programmable computers and featured more than 2,000 valves and was the size of a small lorry." The test involves radio messages transmitted from Paderborn, Germany (home to the world’s largest computer museum, definitely worth a visit), which will be intercepted and fed into the machines for decryption. Results of the experiment should be available soon. You can even play along at home; see the instructions here. I’m no computer scientist, however, so the BBC headline, "Colossus cracks codes once more," caught my eye for a different reason. I immediately flashed back to Colossus: The Forbin Project (1970), a War Games prequel probably recalled only by me and my fellow reveler in obscure sci-fi movies, Hal. Walls O’ Blinky Lights, IBM Selectric Interface, and Ominous Computer Voice aside, Colossus: The Forbin Project is an entertaining tale that stars Eric Braden and Susan Clark and features Marion Ross and Georg Stanford Brown. Sadly, Dana Andrews’s agent overlooked this opportunity. Maybe Andrews was exhausted from Crack in the World and The Frozen Dead (alas, neither available on DVD). The air show season is over (in North America), but you can get a virtual fix at a new Web site, Air Show Buzz. The site features videos, photos, and schedules. I’ve had the good fortune to meet and share the skies with many pilots during my flying career. Over the last couple of years, I’ve been gradually learning about formation flying under the tutelage of several experts when I visit Boulder City, NV (61B) to fly my Extra 300L. I recently enjoyed a refresher as part of a four-ship fight. I was in my Extra 300L with two RV-6As and an RV-8. Our lead (in his RV-6A) was Mark DuLaney, an experienced Air Force fighter pilot and instructor (his last assignment was as commander of an aggressor squadron at Nellis AFB). "Dula" has been an excellent and patient instructor, and I’ve also benefited from the generosity, experience, and skill of several other former Air Force pilots (including Mike Smith, below in his RV-6A painted in Air Force colors) who have baby-sat me while I fumbled through the fundamentals of flying in close proximity to other aircraft. It’s a demanding–and rewarding–discipline. Like aerobatics, it requires careful preparation (including thorough briefings before and after each flight), concentration, a fine touch on the controls, and a keen understanding of aerial geometry. I learn much from each flight, and I’ve gained new respect for the folks who do this type of flying "for real," when they have to combine the challenges of formation flying with all of the other demands of flying combat missions. Glenn Smith, a retired airline pilot, has often volunteered to fly lead in his beautiful RV-8 (above) so that I could practice basic formation skills. You can find photos (the big, clear ones are courtesy of Pat DuLaney) and video from that practice flight in one of my SkyDrive folders. The videos are in Windows Media Player format (available for various versions of Windows and Mac OSX).